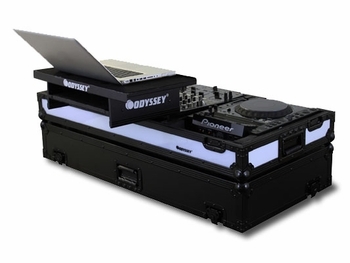 Odyssey FFX3GS12CDJWBL FLIGHT FX3™* Series 3 LED Panel Glide Style DJParts - All Variety of Parts that DJ Needs. The ordinary has become extraordinary with Odyssey's new Flight FX™ case series. Flight FFX3 Series cases have three color changing multi-mode LED panels embedded into the sides and front lower walls of the case. The panel can be set to any one of seven colors or can be set at a variety of color changing modes. For multiple case setups, any FX case can be synchronized to another by connecting the control boxes. Each Flight FX™ Series case is constructed with the same black anodized and powder coated black hardware as our Flight Zone® Black Label™ cases complimenting the visual aura of the glowing panel. Become center stage at any gig behind these cases. Innovating? Of Course! Another Spectacular original Odyssey Design. Just excellent!!! Large format CD Coffins can hold: • American Audio Flex 100 MP3 • American Audio Radius 1000 • American Audio Radius 2000 • Amercan Audio Radius 3000 • Denon DN-S3500 • Denon DN-S3000 • Denon DN-S3700 • Denon DN-S5000 • Denon DN-S5500 • Denon DN-HS5500 • Gemini CDJ-600 • Gemini CDJ-202 • Gemini CDJ-203 • Gemini CDJ-210 • Numark NDX800 • Numark V7 • Pioneer CDJ-1000 • Pioneer CDJ-1000MK2 • Pioneer CDJ-1000MK3 • Pioneer CDJ-2000 • Pioneer CDJ-800MK2 • Pioneer CDJ-850 • Pioneer CDJ-900 • Pioneer DVJ-1000 • Stanton C.303 • Stanton C.313 • Stanton C.314 • Stanton C.324 • Technics SL-DZ1200 and more!